Kids seem to love bugs or hate them... but either way, they are pretty curious about them. This week my son is at camp all day (9am-3pm), so my daughter and I have a lot of time to play and create together while the baby is napping! Since we are participating in Bug Week for the Virtual Book Club Summer Camp, we decided to share a simple ant puppet and snack with you today! 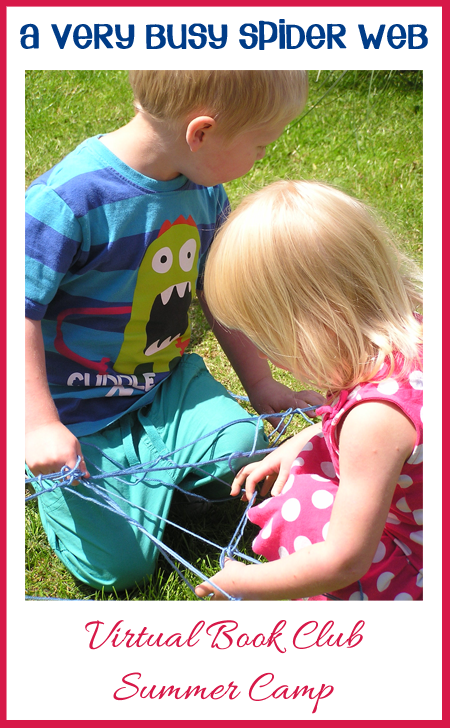 Our next session of camp is starting soon! Go HERE to sign up. We started off our day reading several of our favorite bug books. 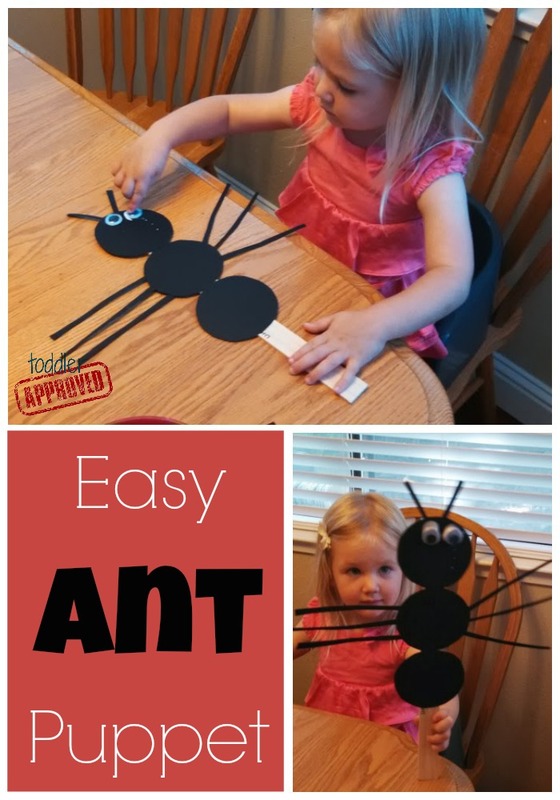 Afterwards, my daughter was adamant that we do an ant project, so we grabbed our materials and started assembling an ant puppet! First I cut out three ovals for ant body parts and she counted the ovals. 1-2-3. Then I cut two antennae and she counted them. Then I cut out six legs and she counted them. After that we sang our Ant body part song to the tune of "Head Shoulders Knees and Toes." Next we glued the body parts onto the paint stir stick, added googly eyes, and let everything dry before we played with it! While we let our ant puppet dry, we made an Ant snack! Cut the apple and carrot into slices so that you have three apple body part chunks and six thin ant legs. 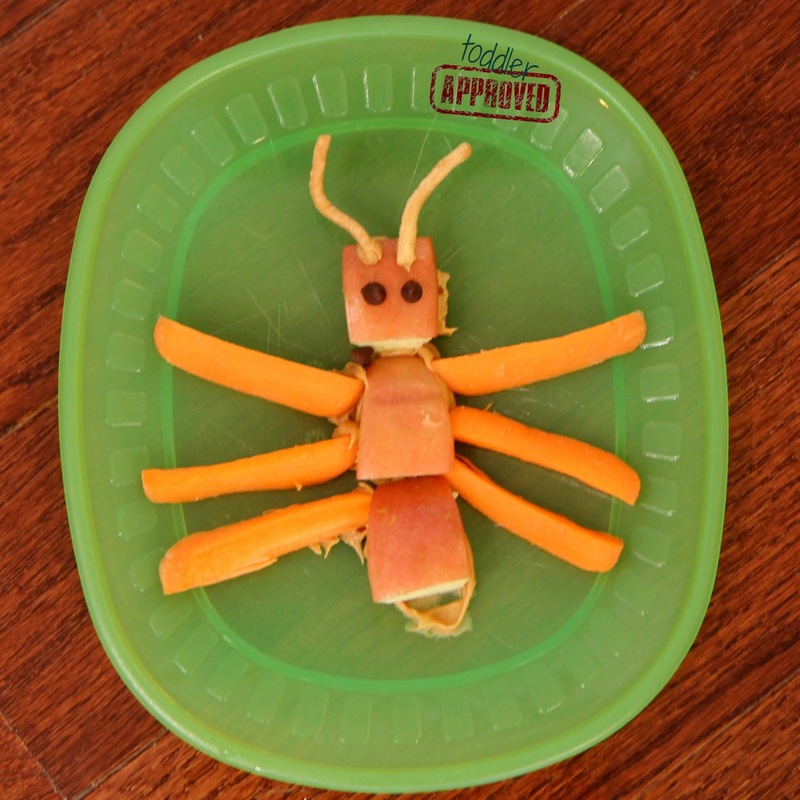 Spread peanut butter on your plate and then stick the three ant body parts and six ant legs onto the peanut butter. Stick two antennae on with peanut butter along with two eyes... and then EAT! 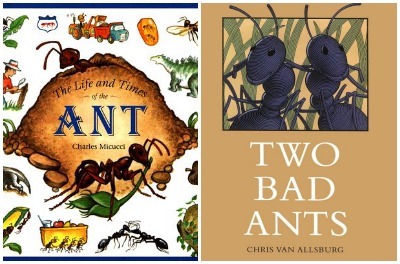 For ant themed books you could read Two Bad Ants by Chris Van Allsburg along with these activities or check out The Life and Times of the Ant by Charles Micucci. Both of these books are for elementary aged kids, but we have them in our house and we love to read through them with my toddler because they have great pictures. Often I will make up my own words or summarize the story or text while still using the pictures. If you haven't signed up for our Virtual Book Club Summer Camp weekly email planner, you can click here to sign up. Every week of camp you'll receive themed book lists, activity ideas, materials lists, and some other great info to make your summer awesome. If you are joining us, let me know! If you post pictures this week we'd love you to use the hashtags #vbcsummercamp and #bugweek if you are posting anywhere so we can find them and share them! You are also welcome to share photos and links in the comments or on our VBC Facebook page.